72 Landscape Architect and Specifier News I n f o r m a t i o n R e q u e s t # 5 1 6 FNGLA 2019 Landscape Awards Open for Submissions The Florida Nursery, Growers and Landscape Association has begun accepting submissions for its 2019 Landscape Awards program. According to FNGLA's website, the program has been enhanced since last year, and now includes an all-new Landscape Irrigation award. FNGLA members and nonmembers alike are encouraged to submit to enter the program, as the association wishes to honor Florida's best landscape projects from 2018. All landscaping firms (landscape architects, landscape designers, maintenance and irrigation) are invited to submit their projects. The deadline to enter the awards program is March 31, 2019. 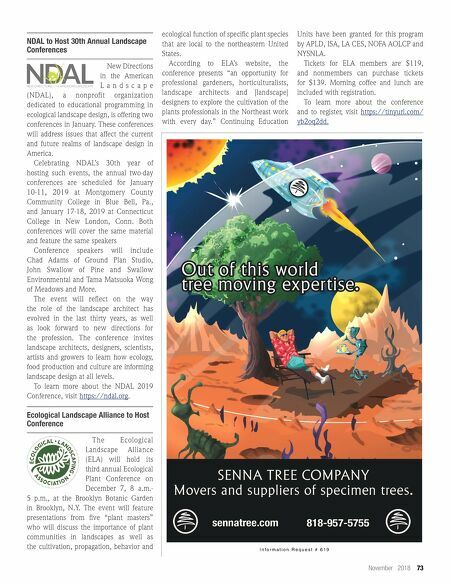 FNGLA's Landscape Awards will be presented at the 2019 Landscape Show, September 19-21, 2019, in Orlando. For more details, please contact FNGLA via phone at (800) 375- 3642 or by email at info@fngla.org, or visit https://tinyurl.com/y8gkchv3 . ASLA Southern California 2018 Professional Awards On October 4, the Southern California ASLA Chapter held their 2018 Quality of Life Design Awards. This is a bi-annual event; the last awards ceremony of this kind took place in 2016. The theme for this year's awards was "Celebrating the Tapestry of Southern California … Diversity Woven Together." Designs were judged on functionality; relationship to context; relevance to the profession, the public and the environment; the enhancement of quality of life; environmental responsibility; and sustainability. Participants could receive either an honor or merit award in fourteen categories. The 2018 Honor Award-winning firms include: • BNIM+ LandLab • LPA, Inc. • Laboratory D+H • Marcie Harris Landscape Architecture • EPTDESIGN • Cliff Garten Studio • Pacific Coast Land Design • SWA Los Angeles • AHBE Landscape Architects • David Evans and Associates • SWA Laguna Beach Vicki Phillipy, the Chapter's executive director, presented the 2018 Ruth Shellhorn award to Perry Cardoza, ASLA, executive vice president of NUVIS, Inc., and Stephanie Landregan, FASLA, (picture, center) program director of the UCLA Extension Program, for their achievements in the landscape architectural profession. There were over 200 people in attendance at the Omni Hotel in Los Angeles to celebrate the event. 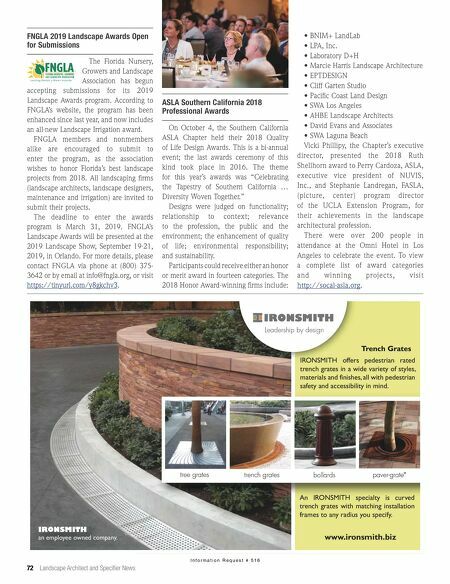 To view a complete list of award categories and winning projects, visit http://socal-asla.org .